The many islands that make up the Solomons are grouped into nine regions or provinces. Each region has their own provincial government and their own particular characteristics and customs. Honiara is the capital. The city is also the international gateway to the Solomons and the hub from which to get out and explore the regions. Their beauty, remoteness, friendly people, stunning coral atolls and exotic jungle clad islands will have you going back for more. Apart from being home of the country’s capital, Honiara, Guadalcanal is a mountainous tropical island. It was the scene of many fierce battles during the Pacific War form 1942 to 1945. There are very few roads beyond Honiara, which makes access challenging. For the intrepid traveller Guadalcanal abounds in natural wonders. At the eastern tip lies Marau Sound, an area of turquoise waters dotted with lush tropical islands. From Marau you can access the south side of Guadalcanal, known as the Weather Coast. Here you will find remote villages nestled along a rugged and dramatic coastline. Iron Bottom Sound, the body of water between Guadalcanal, Nggela Islands and Savo is so-called because the sea channel is the watery graves for many warships and fighter planes – allied and Japanese alike. This group of islands comprises the Nggela (or Florida) group across Iron Bottom Sound from Honiara, Savo and Russell Islands, to the north east of Honiara. Attractions are superb dive sites and natural wonders like the unique megapode birds breeding on thermal springs on Savo Island. Tulagi, the colonial capital of Solomon Islands, boasts historic tales and sites. Russell Islands has one of the largest coconut groves in the South Pacific. Comprising 11 main islands including new Georgia, Vella Lavella, Kolombangara, Rendova, Ranongga, Vangunu and the Shortlands. Dubbed the mecca of Solomon Islands’ tourism, the province boasts magnifi cent aerial views of verdant islands and azure lagoons. Perfect underwater visibility makes the west an excellent dive destination, teeming with marine life and corals. Fierce battles during World War II left behind wrecks that are must dive sites now like the Toa maru in Kololuka Bay and the Grand central Station near Gizo. Kennedy Island named after the late US President J f Kennedy is about 10 minutes by speedboat from Gizo. The Kavachi underwater submarine volcano offers a rare display of nature at work, and the massive Marovo lagoon is a proposed World heritage site. Eco-lodges dot Marovo and Vonavona lagoons, once home to the dreaded headhunters of the province. Skull shrines can still be found in the region. These bodies of calm water are great fishing spots as well. Vella Lavella is – like Savo Island in the Central Province – home to megapode birds. Provincial capital: Gizo Population: 62,739 airport: Gizo, Munda, Seghe, Ramata, Gatokae & Balalai. Seaport: Noro and Gizo are the main ones. Isabel Province is made up of one main island lying to Guadalcanal’s north west. Buala’s laid back atmosphere is a big draw card and the provincial capital has a lot to off er to those out for an adventure. Activities range from guided bush walks, visit to a village built on silts in Kia, breeding sites for the endangered hawksbill turtles or lessons in traditional dances. Isabel is also famous for its unique dance for women, the story of its vanishing lake and numerous skull shrines depict a violent past. Bird and crocodile watching can be organised as well as attending a pan pipe concert. Under-developed, Choiseul is an adventure’s haven. Comprising one large island of 3294 square kilometres and lying north of Western Province, Choiseul’s main attractions are its virgin, untouched natural wonders like the nestling grounds of the endangered hawksbill turtles. Whales have also been sighted in the surrounding waters. Choiseul is home to rare pottery and weaving. A natural and cultural delight as its main attractions, Malaita comprises one main island to Guadalcanal’s east as well as atolls to the extreme north namely Ontong Java and Sikiana whose inhabitants are Polynesians. Man-made islands in and near Auki, the provincial capital, are a must see. Malaita is also home of the traditional but still in circulation shell money. Ancestral worship ceremonies and other rituals as shark calling are still practised in certain regions. Some villages especially those up in the mountains are diffi cult to access. The province is also renowned for the haunting sound of its unique panpipe bands especially along ‘are ‘are lagoon. A more recent fi nd are the perfect surf breaks in Lau Lagoon and Suava Bay in northern Malaita. 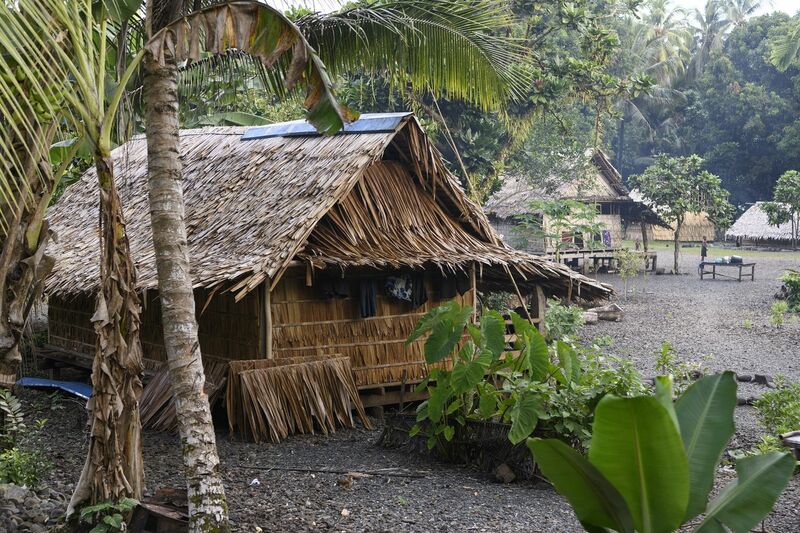 Through support from Surf Solomons, landowners are encouraged to open eco-lodges in the area. Rennell, a World heritage site, is the main attraction with the South Pacifi c’s largest inland lake of lake Tegano. The two-island province of uplifted coral lies directly south of Guadalcanal. The lake and its surrounds are home to numerous endemic birds and plants. Activities for visitors include land crab hunting, spear diving, night fishing and dolphin watching. A number of rest houses are by the lake while Bellona offers cave accommodation. The islanders are Polynesians thus visitors get exposed to ancient songs and dances. Visitors will fi nd this province lying south of Malaita and southeast of Guadalcanal is full of surprises. Some cultural practices are unique to Makira and Ulawa like ancient fi shing methods, crocodile wrestling and the shark hole underneath a church altar at Suholo village in ulawa. Witnessing the island’s annual land crab harvest should be a highlight. It is where the rare Pacific Ridley turtle nests. Comprising three main islands in the extreme east, Temotu o ers a historical and culturally unique experience for visitors. The French La Perouse wrecks were found here and Spanish explorer Álvaro de Mendana entered the Solomons’ archipelago through Temotu, proven by sites of a Spanish village he attempted to build. The country’s most active volcano is at Tinakula and the unique red feather money is found here. Ancient and massive Kauri trees grow at Vanikoro and Santa Cruz. In addition, if you are a surfer, perfect curls can be found at Carlise Bay.